This is another workhorse in the HP ZBook range of notebooks targeted at corporate and business users. Although described as a mobile workstation, HP ZBook 17 is a computing beast both in terms size and performance. HP ZBook 17 flaunts an elegant design that is fitting for a professional user. The body of the HP ZBook 17 feels metallic and rugged, while the base of the computer and the display frame features tough plastic. The maintenance hatch on the underside of the ZBook 17 workstation can be easily undone without any need for a screwdriver. The laptop, which weighs almost 3.78 kilograms without power adapter, uses a chiclet-style keyboard. Its 17.3-inch diagonal screen has different resolutions ranging from HD+ (1600 x 900 pixels) to Full HD (1920 x 1080 pixels) resolution. The display uses HP DreamColor technology and has impressive viewing angle. An average corporate user should find HP ZBook 17 adequate for their need in terms of performance. The mobile workstation is powered by efficient Inter Core processors, including quad-core Intel Core i7 processor. Entry level models may feature dual-core Intel Core i5 processors. The chips are backed by RAM of either 8GB or 16GB, with support of up to 16GB or 32GB of RAM depending on the configuration. HP ZBook 17 is designed to deliver professional-level graphics with its NVIDIA Quadro and AMD FirePro professional graphics. HP ZBook 17 will comfortably handle a great number of highly demanding applications, having been ISV certified. But while this machine will do impressively well for business purposes, it is not exactly a perfect fit for playing modern games. 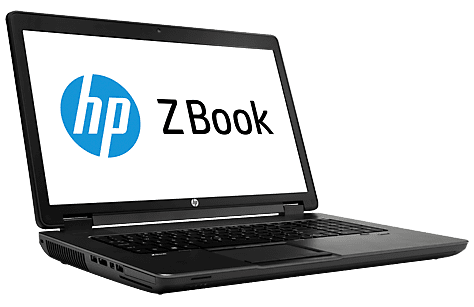 HP ZBook 17 will use Microsoft Windows 7 Professional (64-bit) operating system, but users are free to opt for Windows 8 Pro (64-bit) if they so desire. It comes with an HD webcam and a 128GB SSD or up to 3.2TB hard drive. The machine is provided with several interfaces, including four USB ports (three USB 3.0 ports), one Thunderbolt port, one DisplayPort and one card reader. Security of business users is also covered in the HP ZBook 17 with features such as fingerprint scanner and TPM 1.2. There is also HP Sure Start to help restart and restore your system to a stable state if it becomes corrupted. HP ZBook 17 mobile workstations are available in Nigeria. HP ZBook 17 price in Nigeria starts at around N300,000, depending on your location and the configuration of the laptop.